Conrad Eugene Sissell, 74, of Newport News passed away on Wednesday, March 20, 2019. Conrad was born on March 24, 1944. 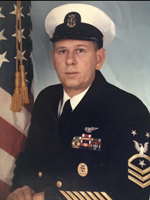 He served 30.5 years in the Navy and retired as a Command Master Chief in 1991. He was a loving husband, father, and grandfather and will be greatly missed by his family. At Conrad’s request, no services will be held. Those wishing to honor his memory can donate to the Wounded Warrior Project or the local Peninsula SPCA. Arrangements by Weymouth Funeral Home.